Chipotle sauce (whatever sauce you like, really). Heat first 4 ingredients on the stovetop. While that’s heating, chop up an avocado or two! 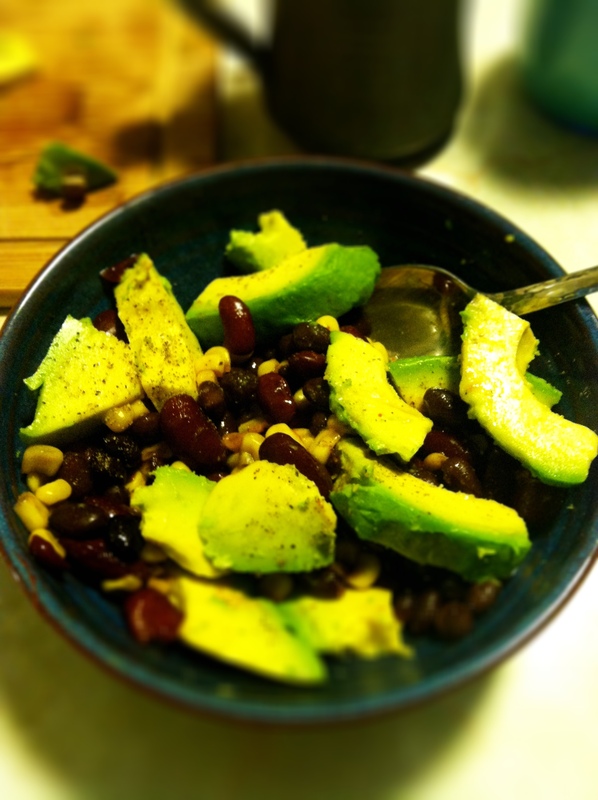 Drain warm corn & bean mixture, add sauce, top with avocado, season with salt and pepper. Dinner is served, in under ten minutes, and it contains whole protein (beans and corn) and healthy fats (avocado)! I’m teaching my first real class this semester, and trying to propose my dissertation before the semester ends, so I’m on campus until laaaate these days. Tonight’s delicious bowl of goodness? Perfect for a week like this! There is a lot of pushback against the plant based diet. To reiterate, I’m not vegan – but I am trying a 7 day plant based diet, to see how I feel, and to get into the habit of eating more plant based meals. And the first thing absolutely everyone says in response to the word “vegan” is OHMYGOSHWHATABOUTPROTEIN?!! Because animal sources such as meat, eggs and dairy are a necessary source of protein, right? Right? Right? Animal sources are one very convenient source of whole protein. Plants are another, arguably more convenient, source of whole protein, when we eat broadly across the different plant families throughout the day. Let us break this down a little. We need three macronutrients in our diets. Carbohydrates. Fats. Protein. We also need a lot of micronutrients – minerals like calcium and iron. A plant based diet is very rich in carbohydrates and micronutrients, but it does require a little extra thinking about protein. What do we mean when we talk about whole protein? (Now I get to use all that anatomy and physiology coursework I took in pursuit of my masters! Huzzah!) Proteins are made up of amino acids. Our bodies need 20 specific amino acids to survive. We link these up to form peptides, and we link peptides up to form proteins. We can make (synthesize) 11 of the amino acids our bodies need, but there are 9 that we can’t synthesize. That means we have to consume those 9 amino acids from food sources. These we term “essential amino acids” – as in, essential to our diets. And our bodies need to consume these amino acids in the right proportions to build the protein we need to survive. Children also need cysteine, tyrosine, and arginine. Parents of children on a plant based diet should consult with a registered dietitian to ensure that children are getting the nutrients they need to thrive. Whole protein is that which contains all 9 essential amino acids. And yes, let’s get this out of the way right now – animal proteins are whole proteins, containing all 9 essential amino acids in the right proportion we need to build protein. We don’t have to eat them in any combination with other foods in order to reap the full benefits. So if you’re eating animal proteins,you don’t have to give any extra thought to amino acids. But what about eating a plant based diet? Plants have proteins, too. But a plant based diet does require a little extra thinking about whole protein. Why? Because most plants don’t contain all 9 essential amino acids. (There are a few exceptions to this rule). Across the day (not a single meal) we need to eat all 9 amino acids – enough of each to build protein. Being deficient in even one amino acid means being deficient in protein. The easiest way to ensure that you’re getting enough of each amino acid is to eat a wide variety of plants – nuts, seeds, legumes, leafy vegetables and grains – across the color spectrum. This will ensure that you’re getting all of your amino acids. So. Can you survive on all fruit? Absolutely not. Should you eat only lentils for the next 30 days? No. No, don’t do that. There is no solitary food source that will keep you going for long – you need to eat a balanced diet. But does that balance have to include animal sources? Not really. With a little extra thought, you can get your fats and essential amino acids from plant sources. (Fats are a topic for another day). And that’s the truth about protein. Young, V. R., & Pellet, P. L. (1994). Plant proteins in relation to human protein and amino acid nutrition. American Journal of Clinical Nutrition, 59(5). Available here. Yup. It’s a lot of eggs. Now, preheat your broiler on high. In your cast iron, over medium-high heat, saute your veggies in oil for a quick minute. You want them to still be crisp/crunchy, because they’re going to cook more. Whisk your eggs and pour them in with the veggies, top with your spices, and cook until they’re just starting to firm up on the outside (about 3 minutes). 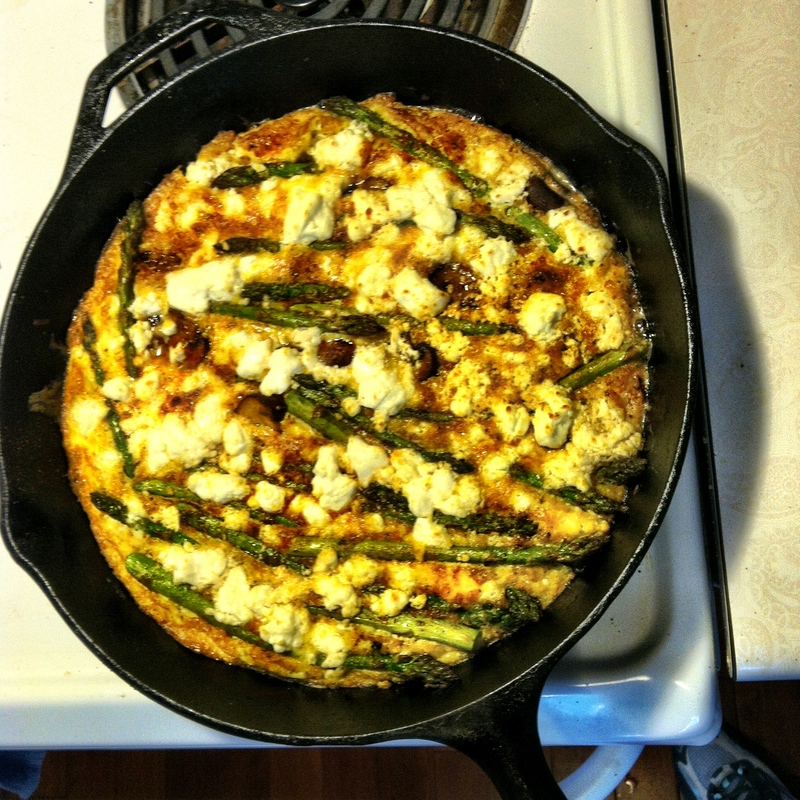 Drop pinches of the goat cheese on top of the frittata and pop it into the over for another three minutes or so. It should be firmed up and golden on top, and it should smell amazing! That’s all there is to it. Simple and lovely and perfect for when you want a filling meal in a hurry. I make it for our dinner and then we eat it the next day for breakfast or pack it in our lunch. The goat cheese and cayenne balance each other out so perfectly, and it’s almost as good cold as it is hot.